If you’re in the Energy and Utilities sector, then this whitepaper should be a great read. This sector is changing constantly and new technologies are arriving every day that impact how energy is produced and distributed. Discover trends, research and editorial content that will give you the perspective you need to make operational decisions. 2017 was a challenging year in the energy and utility space with some foreshadowing of things to come. How do Energy and Utility (E&U) companies simultaneously innovate and economize? How do they fend off new entrants? How do they face myriad threats and opportunities not seen in decades as players scramble to maintain and grow the value they deliver to their various constituencies? 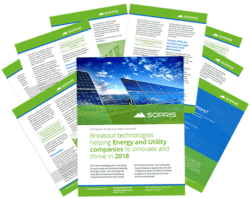 While there is a long history of internal and external threats facing utility companies, today the stakes are raised as disruptive technologies are entering the market and changing decade-long paradigms. Players are having to maneuver to stay relevant and smart companies are seizing the opportunity. Today the stakes are raised as disruptive technologies are entering the market and changing decade-long paradigms. This paper will lay out some of the most pervasive challenges in the market today and discuss how some early movers are taking advantage of emerging technologies. It’s no secret that the falling costs of wind and solar are accelerating the move to clean energy. The capacity for renewables is expected to double over the next 10 years. In 2009 it cost $300 to generate 1 MW of electricity, today it costs $100. There are many examples of how the new economics of wind and solar are displacing traditional power generation. The state of Nevada lost 6% of its utility business overnight when 15 casinos switched to small renewable providers. The state of Hawaii has a stated goal of having its state utilities generate 100 percent of its electricity from renewable resources by 2045. This goal is looking more attainable after Microsoft collaborated on an IoT enabled renewable energy initiative, to create an autonomous energy grid that stores surplus energy for future use. While the US is lagging behind the European and Asian energy and utility companies, many US companies are expediting strategies to improve the supply-side by incenting customers to participate in the generation of renewables. Recently more than 60% of utility companies cited reliable integration and distribution of renewables as an essential element of their go-forward strategy. Behemoths Google, Amazon, Apple and Walmart are entering the energy space, building or buying solar and wind farms to meet their own consumption needs and to sell surplus. Their independence from traditional suppliers is a real threat to revenues. IDC claims that non-utility companies will claim 20% of the energy retail market by 2020. Additional competition is emerging from self-powering communities who are also working toward energy independence. These communities, like college campuses or cities, are owning and operating renewable energy facilities. Other “virtual-consumer” communities are installing subsidized roof-top solar panels and wind turbines to buy, sell and store energy from one another. And then there are the RenTechs. Like FinTechs, that exist to compete with traditional business models in the delivery of financial services, RenTechs are looking to disrupt the E&U space with renewable technologies. RenTechs are expected to deploy new business models and new capabilities with improved efficiencies and economies over the traditional players in the energy sector. Going forward, E&U companies must be prepared to compete with corporate giants, non-profit communities and small agile start-ups. The days of selling a commodity service to a captured customer base are long gone. Customers today have options and expectations. They expect service levels that are equal to or greater than those they get from other services, like banks and investment advisers. They demand fewer and shorter outages after storms and improved usage data to better manage their consumption and associated costs. Consumers today have gotten used to concepts like real-time tracking of service technicians, on-line scheduling and the ability to change requirements real-time. Companies lagging to meet this new standard need to catch up or pay the price that comes when unhappy customers have options. Energy management was one of the early capabilities of the “smart home” and the customers voice is getting louder as the “smart home” market exceeds $100 billion in the coming years. Aging power grids and a shrinking workforce are just some of the economic and operational challenges that are facing traditional energy and utility companies. Many utilities are somewhat trapped by the high costs and inefficiencies of aging assets. The Grid Modernization Multi-Year Program is one of the largest single undertakings in US history. The daunting task is essential to integrate renewables, improve security and reduce costs. The US population is aging, and the trend is even steeper in the Utilities marketplace. The US Labor Department estimates that as much as half the talent will retire in the next decade. The utilities space must compete with high-tech companies to recruit highly-compensated engineers. Three out of four utilities companies report having difficulty finding the talent required to execute their strategies. Three out of four utilities companies report having difficulty finding the talent required. All this means utility companies must gain new levels of agility and operational efficiency. Many E&U companies are pushing ahead with smart technology investments in their infrastructure, embracing alternative energy sources and investing in digitalization and IoT. They are overhauling parts of their operating and business models with a measured, road-map approach. Let’s look at some of the opportunities and considerations. Energy and utility companies today are more than generators and distributors of power, they’re in the data business. Connecting smart devices, like smart meters, and deploying sophisticated new equipment (now a regulation in parts of Europe) creates massive amounts of valuable data. Artificial intelligence (AI) is quickly becoming one of the best alternatives to sift through and make sense of all this data. Gartner predicts that “by 2022, more than 80 percent of enterprise IoT projects will have an AI component, up from less than 10 percent today.” Machine learning, which has grown out of AI, applies sophisticated statistical analysis on data to essentially ‘learn’ and improve the performance of your assets without programming. These technologies are being applied with success to improve forecast planning, predictive maintenance, scheduling and workforce management. Augmented Reality (AR) is paying big dividends, especially when dealing with complex assets, large geographies and a less experienced workforces. Wearables, like goggles and headsets, and other mobile-enabled devices allow a technician to access service history and locate parts in real time. AR allows more experienced technicians and engineers to remotely assist less experienced techs on site reducing the time and costs of problem resolution. Cloud computing means new levels of flexibility, speed and scalability. But despite this undisputed fact, moving to the cloud in the energy and utility companies space has been slower than other markets. This is largely due to a risk-aversion mindset and concerns about passing operational expenses (versus capital expenses) through to consumers. The benefits of the cloud today are too great to overlook. If you’re not moving part or all of your computing to the cloud, it’s costing you efficiency, profitability and service quality. Renewables are now getting half of the investment dollars in the energy generation space and moving into this sector will require a different mindset, business model and more advanced technologies than used by traditional companies. Many traditional companies are setting up separate entities focused entirely on renewables – and establishing unique processes including resource planning, field service, asset management and supply chain management. Accordingly, these new firms require more agile, flexible and easy to deploy technology platforms in the cloud. The intermittent characteristics of renewable energy creates a variety of complexities in generation mix and imbalances in the network that must be managed. The variability characteristics of weather effect 70% of daytime solar capacity and 100% of wind capacity. And distributed generation creates complexities of technical integration. Eventually large-scale storage on the grid, improved weather forecasting and wide scale aggregation and distribution will mitigate the uncertainties of renewables. Surely new regulations will follow as new business models for renewables evolve. While customer’s wants, and preferences are changing, different customer groups have unique needs and different expectations – some are buyers and some are sellers with new levels of participation. Deploying big data initiatives will support a utility company’s capability to offer a more personalized service. Energy and utility companies must transition from commodity selling to a segmented value proposition and delivering an exceptional customer experience (CX). This means embracing concepts like omni channel, real time billing, mobile payments and digital experiences. Energy audits and analytics allow consumers to better manage consumption at their homes, enabling their “smart homes” to find new efficiencies and lower energy consumption and costs. The “smart home” market is expected to be worth $138B by 2023. The digital revolution is here for energy and utility companies. New technologies, new competitors, new types of customers and new forms of energy. The market leaders will need to prove their ability to improve efficiency and expand their customer bases, by adding new capabilities and deploying improved business models. The good news is with disruption comes opportunities, for those that are willing to adapt and transform.